MILAN, AprilÂ 10, 2019 /PRNewswire/ --Â Italian design and the cult of beauty, with an eye to well-being understood as a way of life: this is the philosophy underlying Chorustyle, the project for objects, fashion and furniture totally Made in Italy born from the mind of entrepreneur Domenico Bosatelli and now ready to debut at the Fuorisalone 2019, the most awaited appointment of the Milan design week. From 9 to 14 April in the Tortona area, at the vibrant heart of the Salone del Mobile, Spazio Opificio 31 will welcome the varied and luxurious universe of a visionary brand that has its roots in the history of Italian know-how but at the same time looks to a contemporary scene rich in stimuli. Here is a brand capable of being a synthesis of that creative flair and expressive force that have made Italian manufacturing a distinctive value all over the world and that now characterises the firm's collections of design, objects and fashion. The Fuorisalone will provide the venue for the presentation of the protagonists of the uninterrupted evolution of design 3.0 by Chorustyle, starting with Oasis, the new line of desks, Board, the home-office furniture collection created in collaboration with Tino Sana, in which the striving for perfect balance and harmony between material, aesthetics and function gives life to a new way of living in every space, from home to office, completely free of conventions and customs, and Point, the rotating glass and steel tray. The heritage of manual skills and technology tout court with the plus of an iconic symbolism are what connote Nikko and Laki, precious design objects with a sinuous feline shape. They will accompany visitors through the exhibition space, embellished by the prÃªt-Ã -porter collection which debuted at the recent Milan fashion week. Space will be open to the public 9 - 14 April. 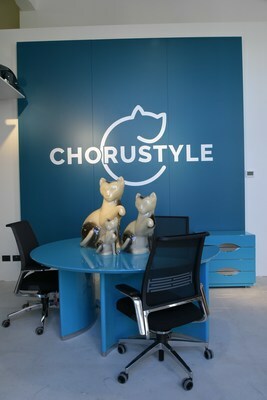 Chorustyle is the new lifestyle brand that has its roots in Italian history, tradition and lifestyle but at the same time looks to the contemporary world, representing the creative flair and expressive force that have made Italian manufacturing a distinctive value worldwide. The symbol of the whole philosophy is the cat, an animal with a timeless charm, which with its sinuous elegance succeeds in calming the mind and expressing the concept of harmony.